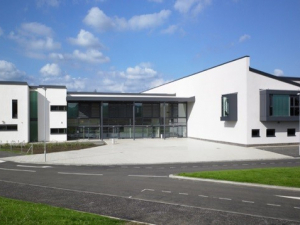 New design and build high school in Linwood. The school is laid out over two floors, with three main wings. The three main parts of the building are linked by a large, roughly rectangular social area, known as The Street, which houses the cafeteria, stage and main meeting area for pupils during breaks. The Street also features underfloor heating and vending machines. Full provision of M& E services including heating, water services, mechanical ventilation, localised cooling for I.T. areas, gas supply, BMS, lighting, lighting controls, power, I.T. systems, emergency lighting, fire alarms, TV, period bell system, clock system, CCTV, intruder alarms etc.